Moonlop Records presents the 2nd compilation from Biolive, compiled by Mizoo. 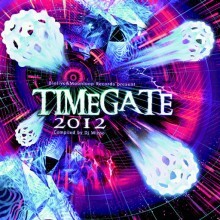 The Timegate parties have been produced in Switzerland since 2002. It is one of the most important psytrance party happening in Europe at New Years Eve, and most of high profile artists of the scene have played there and loved the incredible vibe and great organization. All artist featured here will play on this 2012 edition or have played before: Perfect Stranger, Psyberpunk, Principles of Flight, Sensifeel, Aslak, Lucas, E-Clip, D_Root and Mnnsk. The tracks have been carefully selected by Space Navigator Mizoo to ensure a coherent and far out journey for your mind, deep into your inner space. Are the reflexive bubbles of our consciousness giving colour to our dreams ?